Why you should keep your equipment and spaces clean. 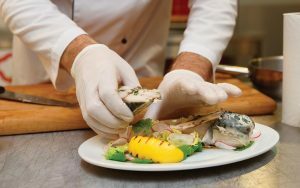 As a restaurant owner, there are few challenges greater than keeping your kitchen, food preparation and storage spaces properly clean and hygienic. What it boils down to is that a lot of time is spent cleaning each day, and that you must ensure you and your staff are cleaning the right way, with the right products and practices. Only this will ensure the food not only tastes great, is presented in an appealing environment, and is reliably safe for your customers to eat. Cut corners even once and not only do you wind up with contaminated food, but a public relations nightmare if you don’t catch it and customers get sick. Bad word of mouth can destroy even the most successful business. The other major benefit of keeping your work and food spaces properly clean is that regular and proper cleaning keeps your equipment in top working order, which means less down time, lower maintenance costs and a longer working life span. All of this adds up to saved time and money. No doubt your staff do a great job cleaning up and sanitising each day. But, day-to-day cleaning is not always enough, and it often doesn’t adequately address some potential trouble spots in your kitchen and/or food storage and preparation areas. Extra attention and specific experts can make all the difference. The ice machine. It’s easy to forget that ice is food. The ice machine should be regularly cleaned to prevent any contamination. Underneath and behind equipment. When you can’t easily see an area, it’s easy to overlook. But, bacteria and vermin will be attracted to food scraps no matter where they fall. The waste disposal area. Your waste and rubbish areas are a playground for bacteria, flies and vermin. Regular cleaning can also reduce bad odors. Fridges and Freezers. Even though these are cold, nasties can still live within! Cleaning these spaces will help the unit function more efficiently, and prevent temperature fluctuations that can lead to spoiled food and increase energy efficiency. Splashes on the walls. While your staff may wipe them up when they happen, a thorough cleaning and sanitising can keep away pests and bacteria that will be attracted to any remains. Cool Room. A large and important space, it’s important that its contents are checked regularly and that its seals, ventilation and temperature control are in top working order as well as any leaks and spills are sanitised properly. Exhaust and ceiling fans. Although behind the scenes and up high these valuable pieces of equipment are responsible for circulating and cleaning the air. If they are filthy or blocked with old grease and food particles it’s a health hazard that can affect the whole area. Dishwasher. A cleaner itself, a dishwasher is used to keep all the things used to eat from and prepare food with, clean. Therefore its especially important that a dishwasher is kept sparkling so it can do its job properly. These cleaning tasks are not only tough to fit into the regular routine, the fact of the matter is that specific cleaning equipment and solutions are required to get the job done properly. To top it off it’s often just as cost effective to hire a commercial cleaning company when you figure in staff time, cleaning supplies and hire of the appropriate equipment. Jaymak’s Total Kitchen Clean and/or Coolroom Clean will result in a cleaner work environment, reduced fire and safety hazards, better efficiency and a meeting of Australian standards and compliance with insurance. This thorough cleaning is particularly helpful if you’re preparing for an inspection and you want to make sure everything is in tip-top shape. It’s less hassle for both you and your staff. Contact Jaymak today to learn more about our professional cleaning services.